The following is a guest post by David Anderson. If you are interested in guest posting, please contact me! Imagine you work for a family-owned company that distributes music equipment. One day, you are looking through some of the old family catalogs and discover that a very cool, unique brand, which has been out of production for years, has a trademark that has expired and is just sitting there for the taking. What would you do? Ted Kornblum’s grandfather founded St. Louis Music Supply Co. in 1922. Among the many brands that SLM has distributed are Ampeg, Crate, Alvarez, and Knilling. Also on the company’s distribution list: Magnatone. Fast forward to the early 2000’s, Ted is sitting at his desk one day and he discovers that the Magnatone trademark was abandoned — there for the taking! So Ted quietly makes some inquiries and soon finds himself the owner of the Magnatone brand. He doesn’t tell anyone. Not even his buddy, the Rev Billy Gibbons. He just… waits. After some years the tables turned, and SLM was that company that ended up being acquired by a larger corporation. We won’t get into the details, but Ted Kornblum eventually found himself free to do what he pleased. Maybe start his own company… maybe do something with his secret acquisition, Magnatone. Now you have to understand, back when Magnatone amps were made, Fender was the utility amp of time, and Ampeg appealed to the jazz market. Magnatone, by contrast, was known as a boutique amplifier, decades before the boutique craze began. Magnatone amps were not cheap. They had great fidelity, reverb and that famous, pitch shifting stereo vibrato. Fender’s dedicated vibrato channel was actually tremolo, not vibrato, changing the amplitude or volume of the signal, not the pitch. To further muddy the waters, Fender incorrectly labeled its guitars’ vibrato unit a tremolo. So Ted had been sitting on this brand a while. He had a long time to think about how to revive the Magnatone line. The first step would be putting together a design team that could make the amps a reality. 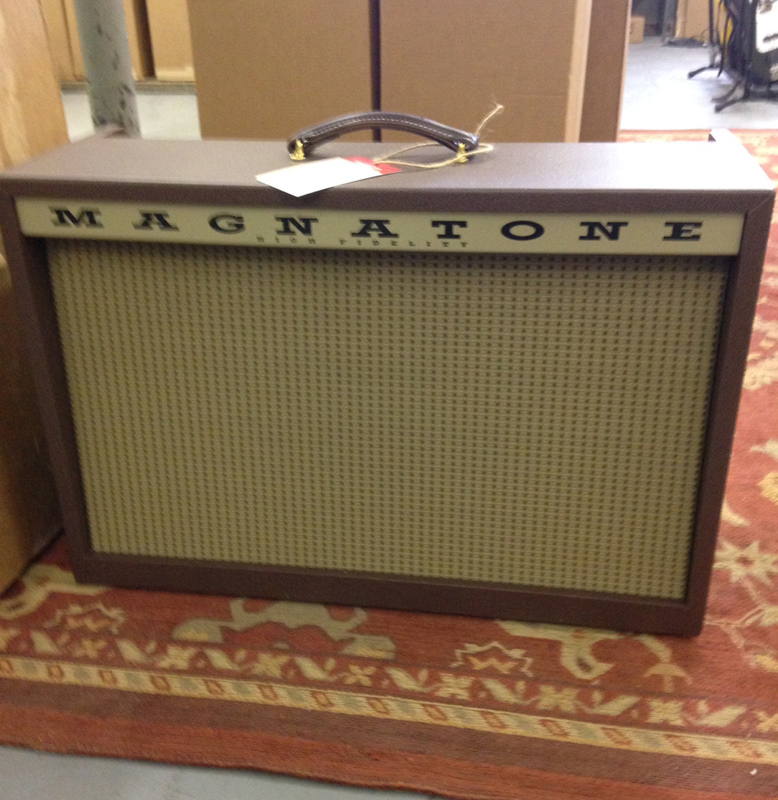 While Magnatone was ahead of its time as far as amp design is concerned, it did have its flaws. For one, the amps were fragile, not up to par to today’s rigorous standards. They also had limited power output — not conducive to today’s rock ‘n roll needs. So the new Magnatones would have to have a balance of both worlds. That luscious, true pitch shifting vibrato, tremolo (yes that FM-AM switch allows for either effect) and a deep, well-like reverb — but with more under the hood, some rock ‘n roll torque for the heavy hitters! To put this plan in motion, Ted had an ace in his pocket… a guy right here in St. Louis who was responsible for designing practically all things tube that came out of SLM, including the revered Crate Vintage Club series amps. 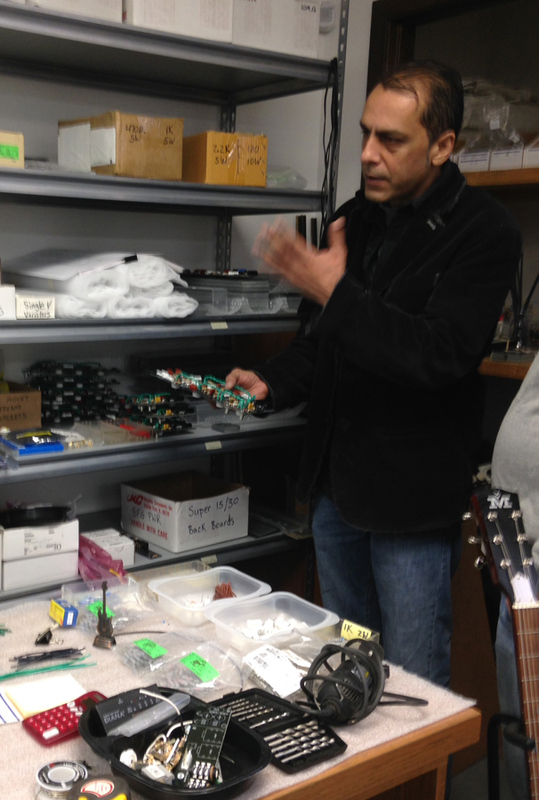 Obeid Khan is not just an engineer with a soldering gun, he’s a player…a serious player! Ask anyone in town, they’ll tell you, Obeid Khan is a monster when it comes to amps and blistering guitar. Khan, splitting time between his own company, Reason amps, and a position repairing vintage tube amps for local vintage gear gurus, Killer Vintage, decided he was up to the challenge of working on the foundation and design on the new Magnatone amps. Ted and Obeid enlisted a team of engineers including Ken Matthews, Greg Geerling, Dan Ryterski, Chris Villani, George McKale, and the famous Neil Young tech, Larry Cragg to make the Magnatone line a reality. Another ace in the hole was having local cabinet builder and owner of Vintage-Amp Restoration, Gregg Hopkins, involved in the design of the amps, making sure to pay homage aesthetically to Magnatone’s retro look. So with an all-star team of engineers and the discriminating ears of players like Billy Gibbons, Khan, and Larry Cragg, the team began to prototype the first models of the new Magnatone amplifier and guitar company. Once the first models began rolling off the bench, the decision was made to bring Dave Hinson, owner of Killer Vintage in St. Louis to help set up a dealer base. 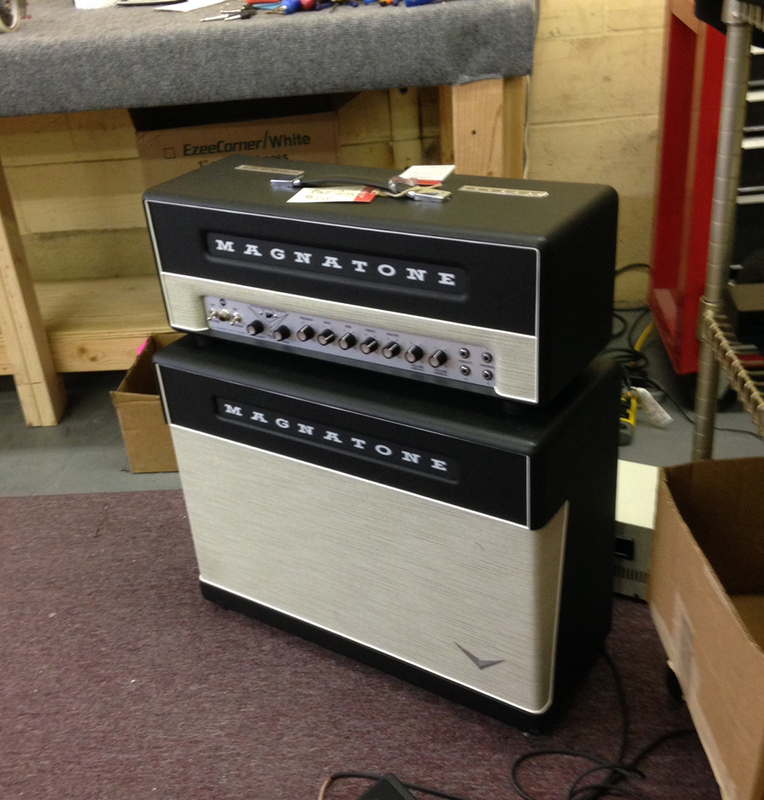 Let me start off by saying that the new Magnatone line of amps is no less than stellar! There are three series: the Studio Collection, Traditional Collection and the Master Collection. All exude tonal quality and craftsmanship, and that is before we consider the features of stereo pitch-shifting vibrato or tube-driven reverb. Between the three series or “collections,” Magnatone manages to offer something to meet just about every player’s needs. From five-watt studio amps to 6V6, American-voiced combos to EL34 British-inspired heads and cabs, Kornblum, Khan and the rest of the crew at Magnatone have produced a line of models that covers all of the bases. I currently have a Magnatone Twilighter in my studio for review and demo. The Twilighter is a 22watt, 6V6 tube combo with tube driven reverb, true pitch shifting varistor vibrato, lush tremolo, and a retro brown tolex that covers the retro inspired cabinet. Reminiscent of a black face Deluxe, the Twilighter is primarily a clean amp and voiced in the tradition of ’60s American amps. It’s bigger sounding than a Deluxe, has more bottom end and more bloom as the notes build and expand from the 1×12″ speaker. The fidelity of the Twilighter is rediculous! It has plenty of headroom, takes pedals excellently, and sounds great with any pickup configuration. I recently took the Twilighter to a pedal steel jam and it held up amazingly well, and sounded great! It’s apparent that Magnatone has reentered the market with a bang, with retro looks that kill and tone to die for! 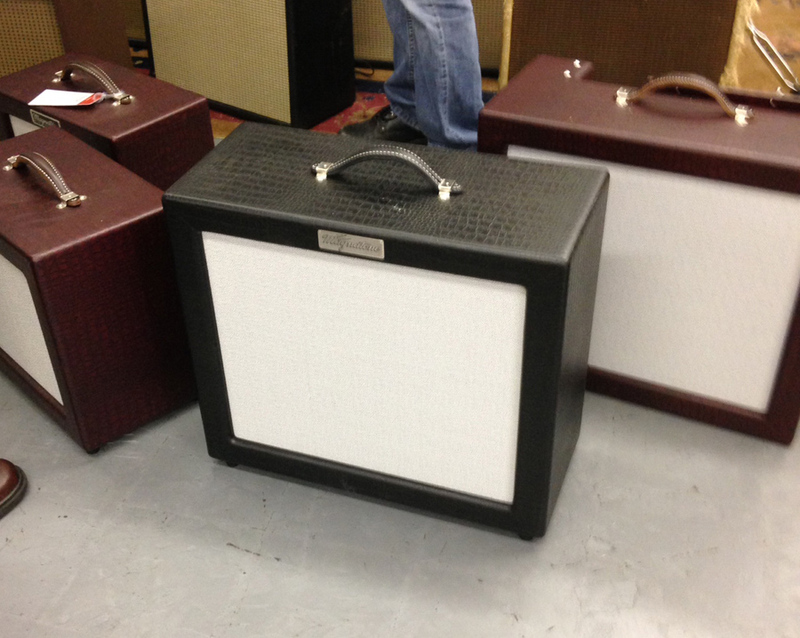 Check out Magnatone amps at your favorite boutique dealer or go to magnatoneusa.com. I’ve worked on a few Magnatones. The reverb “mixer” in original Magnatones run the signal through a huge resistor…10meg ohms if I remember. This causes a real loss in signal. I’ve replaced these with a large pot, 5 meg ohms in series with a 2.2meg resistor and let the customer set the resistance. With the lowering of the resistance the volume and punch comes up, but the reverb diminishes. There was enough reverb to afford to tame it down some. Great amps. Link the channels, and turn the treble up and bass down on one channel and the opposite on the other. The vibrato does wonderful things as the channels are out of phase. Try the opposite. Great fun.